Adobe Photoshop is one of the leading software applications for creating and manipulating and editing bitmaps and images. The software has first released for the Apple Macintosh computers in 1990, and has subsequently been through many iterations, revisions and new versions. Today versions of Adobe Photoshop are available for both Apple Macintosh computers and PCs using the Microsoft Windows operating systems. Photoshop interoperates extremely well with other design software written or marketed by Adobe Systems Incorporated, and supports both raster and vector formats, as well as a variety of color models including RGB, CMYK, grayscale and duotone. The program is based on a powerful concept of layering which allows multiple images to be composited or blended together, and generally makes editing a breeze. Although Photoshop is a well-designed program with an intuitive user interface, getting the most from the program does usually require some learning. This is both because there are a lot of functions and features in the program, and because many new users who want to learn to use Photoshop, do not have previously familiarity with advanced graphic design or prepress concepts. There is however no reason to be intimated by the thought of such learning - it's surprisingly easy to master the program, especially if you take advanced of one of the many Photoshop tutorial web sites, software training packages, or even Photoshop books that are available. While Adobe Photoshop is of course ideal for professional graphic designers, even ordinary folks can produce excellent results, if they just put some effort into learning the program. Photoshop In A Day is a way to learn Photoshop fast. Complete beginners can start working on real tasks in Photoshop within minutes. The layout and style are simple and easy-to-follow. The numbered step-by-step instructions are clear and precise and make for easy progress. Descriptions are jargon-free and the clarity of the tutorials in this quick-learning system will save you time. After the basics, Photoshop In A Day moves on to an intermediate level then to an advanced level. Users can progress in the shortest possible time. 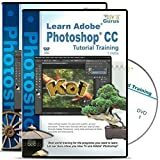 Every user of Photoshop will find new knowledge, new information and new tips and tricks. Learning is without all the effort and confusion of normal manuals. You won't get bogged down in a mass of instructions all at once. One topic is focused on at a time and the tutorials are small and specific. Information is in small manageable sections and divided into individual practical subjects. Creativity will increase as you gain more command over new techniques. Create images you could never do before. Old photos can be re-used and rescued. Develop them for sale on the net to make extra money from newly created images. You will be able to learn every feature in Photoshop, even the little-used features which can be so useful. This way you can get the most out of this large program. Photoshop is constantly evolving, and the newest version offers great new tools for photographers. This popular guide gets visual learners up to speed quickly; previous editions have sold more than 150,000 copies. With colorful screen shots illustrating the step-by-step instructions, this book is perfect for Photoshop newcomers and for visual learners who are upgrading from an earlier version. It covers setting up the software, importing images from the camera, using all the tools, creating an online gallery, and more. Teach Yourself VISUALLY Photoshop CS6 gets visual learners ready to take advantage of everything the newest version has to offer.